Four Points Land Surveying, Inc. licensed in both the State of Missouri, the State of Illinois and the State of Iowa. Four Points Land Surveying, Inc. can provide boundary surveys, ALTA/NSPS Land Title Surveys, topographic surveys, easement and right-of-way surveying and FEMA Elevation Certificates and civil engineering for water and waste water systems and subdivisions. 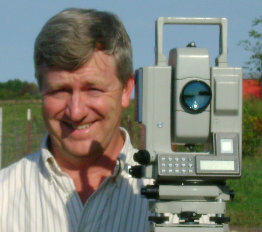 Norm has over 30 years of surveying experience. Prior to opening Four Points Land Surveying, Inc. Norm was the Land Survey Supervisor for Likes Land Surveyors, Inc. He has also worked for the Missouri Department of Transportation and MECO Engineering Company. He is a member of the NSPS, Missouri Society of Professional Surveyors, Illinois Professional Land Surveyors Association and The Early Bird Kiwanis in Hannibal, MO. Norm obtained his Bachelors of Science in Business Administration from Quincy University in 1998. Experience with Trimble GPS receivers, Leitz, Topcon, Wild Total Stations, Sokkia, Carlson and TDS data collectors, and Leica C10 3D Scanner. Kyle has over 22 years of civil engineering experience. Prior to working with Four Points Land Surveying, Inc. Kyle was the Associate Owner, Project Manager and Senior Engineer II at MECO Engineering Co., Inc. He is a member of Chi Epsilon, Order of the Engineer, and serves as the Treasurer of the Northeast Chapter for the Missouri Society of Professional Engineers. He has received his Lead Based Paint and Confined Space Certifications.Kyle obtained his Bachelors of Science in Civil Engineering from the University of Missouri, Columbia in 2003.